SIMPLE PAST TENSE EXERCISESA. Put in was or were into the gaps. 1) I _____ in Canberra last spring. 2) We _____ at school last Saturday.... Dear Sir, I would like to ask a question about the usage of simple past tense. When we talk about a past event/what a person did in the past, and the relevant background information is still true now, should we use simple present or simple past? 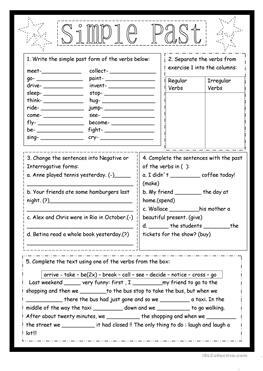 Exercises on Simple Past. The simple past expresses an action in the past taking place once, never, several times. It can also be used for actions taking place one after another or … formation pdf alberta technicienne en pose dextension capillaire SIMPLE PAST TENSE EXERCISESA. Put in was or were into the gaps. 1) I _____ in Canberra last spring. 2) We _____ at school last Saturday. Grammar Rule Examples. I played football. We ate lots of cake! She didn’t watch a film. Remember! For regular verbs, we add -ed. For irregular verbs, there is a special past tense form.